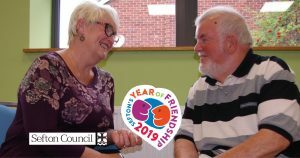 Throughout the Year of Friendship, Sefton Council are celebrating specialist groups who are tackling loneliness by promoting friendship throughout the borough. The Orrell Trust is a small grass roots charity based in Orrell, Bootle and has been running since 2002. It is committed to supporting people who may be isolated or vulnerable living in our community. Several activities and projects are run from St John & St James Church and Community Centre as well as outreach work thus bringing the community together. Their aim is to provide encourage community cohesion and bring benefits to individuals and the wider community. The Orrell Trust is currently managed by a team of 8 Trustees who volunteer their time, skills and knowledge to support the charity. The trust also employs 5 members of staff who manage, develop and deliver projects with the vital support of team of 20 volunteers. Bootle Buddies is one of The Orrell Trusts newest projects. It is a free befriending service that provides support to local people in their own homes, offering a friendly face and ear. The project where possible encourages participants to attend social activities, working to reduce barriers such as mobility, lack of family or friend support and lack of confidence or motivation. The project aims to improve physical and mental well-being and reduce loneliness and social isolation for some of our most vulnerable community members.